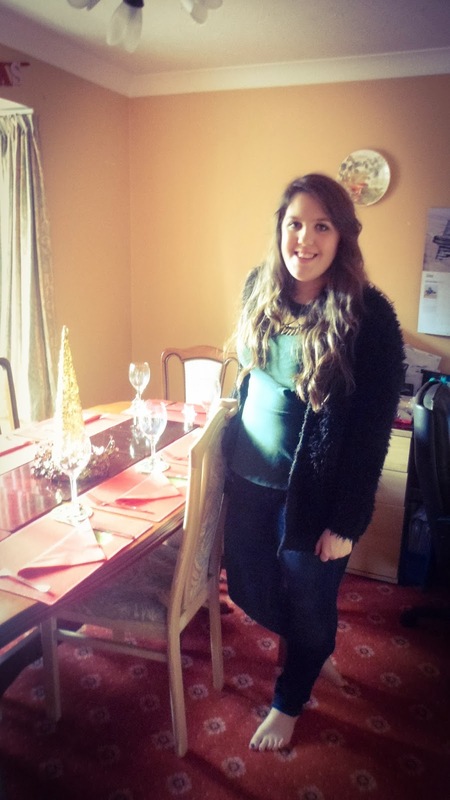 Beautiful You: OOTD | Pre-Christmas Christmas! Today we had a pre-Christmas Christmas with my nan and her husband before they go away for Christmas to his son. So, I decided to dress up a little bit and I thought that I would show you what a wore and how I did my make-up! As you probably know by now I am a lover of peplum tops because I think that they are very flattering and should be a staple piece in everyone's wardrobes! I am wearing one from New Look that I got a while a got but I think they still sell them, I got mine for £9.99 which I think is a brilliant price! Then I have wanted to wear this cardigan of my sister's ever since I have been home and I finally got to wear it today, it is one of those fluffy ones that are really soft and cosy and this one is from New Look. Then have a statement necklace on to tie it all together which is my sisters but I don't know where it is from, you can see it better in the up close picture! Then my jeans are just my standard ones that you see all the time from Primark! I thought that I would also show you what make up I wore, it isn't too different from the make-up I had on in my previous OOTD but I changed up the lips and the eyes! I hope you enjoyed seeing what I decided to wear for a little Christmas gathering and maybe it gave you some inspiration for an outfit! I hope your having a lovely build up to the big day and spending lots of time with your families.